Westerns speak to our independent spirit and yearning for adventure. Our May contest issue has plenty of that with gun totin’, danger chasin’, and stranger courtin’ romances. 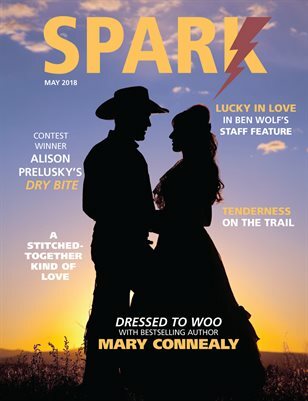 Make sure you check out winner Alison Prelusky’s story Dry Bite, and runner-up Go West, Young Love. Feature author Mary Connealy’s Rough Spun is a laugh-out-loud tale of hidden identity. As I turn my eyes east, toward the crowded cities of India, my last issue as editor of Spark Magazine travels west. Whichever direction you take, know that life is better with romance. Thanks for the journey.